A railway enthusiast has had a lucky escape after narrowly avoiding an express train travelling at around 70 miles per hour. 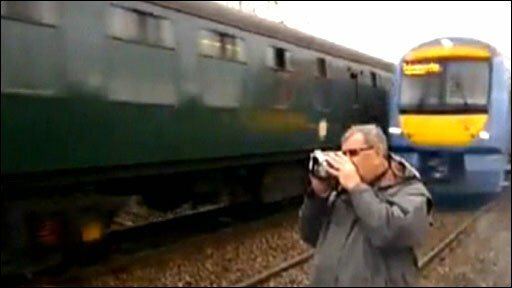 The man was filming the Oliver Cromwell steam train in Thurston in Suffolk, when another train sped through the station from the opposite direction. It almost clipped the train spotter, who seemed unfazed by what happened.